This year marks the third year of the inaugural Persian International Film Festival. Founded in 2012, the festival is the Australian showcase of selected films from Iran and Afghanistan, as well as the best from the Persian community around the globe. It will take place over the four days between the 11th and 14th September 2014 at Chauvel Cinemas in Paddington, Sydney. This year's festival consists of six films with the opening film being Manuscripts Don't Burn, the latest offering from controversial Iranian filmmaker, Mohammad Rasoulof who has had his previous work banned in his own country and a year in prison as a consequence. The Closing Night film which will screen at 6:30pm on the 14th of September will be the Iranian film, Don't Be Tired! The film shows an unique side to Iran that is not often seen from a foreign perspective, which makes this film a wonderful representation of what the Persian International Film Festival is all about. Don't be Tired! will screen at the Persian International Film Festival on the 14th September 2014 at 6:30pm. For more information and for ticket purchases, please see the official website. The road trip film is one that is synonymous with self discovery and emotional growth taking place against a background worthy of a tourism campaign. Yet in films such as Don't be Tired! this is such an entertaining and enjoyable combination that there is nothing negative in this. Don't be Tired! is a wonderful screenplay with both dramatic and comedic elements and incorporates identifiable and relatable characters and themes. It gives the world a chance to see Iran in all it's beauty with some breathtaking landscape shots and glimpses into it's culture as seen through the eyes of foreigners. Canadians, Roman and Maria are a troubled married couple who are on holiday in Iran, the land of Maria's birth. When they have problems with the tourism company they were initially dealing with, fired hotel worker, Morteza presents himself as a tour guide and offers to take Roman and Maria wherever they need to go with the aid of his cousin, Hossein. The four embark on a trip across the country which is anything but uneventful and changes each one in a different way. Road trips and self discovery often come hand in hand with each other in film, which is a cliché this type has fallen into but not without justification. Travellers will understand that one of the great things about venturing away from your homeland is that you are able to reassess and re-evaluate aspects of your life by clearing your mind. This is what people find relatable in a film such as Don't be Tired! For Roman and Maria, much of the addressing of their individual and marital problems are not without pain, but they are problems that needed to be addressed eventually. The film is slightly predictable, which is again directly related to the type of film which it is. Yet one issue that the film addresses which is not one that is so cliché is the idea of what makes a place your home. This is an issue that Maria struggles with throughout the film as she feels no real connection to her homeland being that she left it so long ago. As it is associated with feelings she would rather not remember, she does not consider it her home. Is it the memories or the fond connection you feel to the place what makes it your home? Don't be Tired! is beautifully shot and allows foreigners to see Iran in a way they never have before. 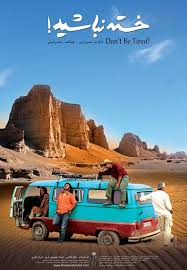 The film does work as a wonderful tourism tool for Iran, starting with a luxury hotel and ending in the Iranian desert. It shows different sides to the country and presents it with pure love and care. The panoramic shots while the four main characters are driving through the desert are really quite spectacular, as are the shots when Roman is underground. Don't be Tired! is a wonderful way to see Iran via film. It shows a land which is rich in culture and beauty, but with it's screenplay presents it with universal themes which are relatable across cultures. The Persian International Film Festival will run from 11-14 September 2014 at Chauvel Cinema. For more information, please see the official website.